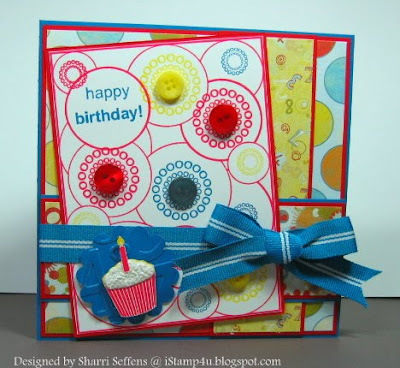 Quickly, and I'll be back with new projects later: today is the last day to upload a card for my challenge on StampTV! Use the colors navy, olive and ivory on your card OR create a stamped focal point that looks similar to the DP you choose to use on your card. Do both to get two chances and you can also use Gina K stamps for another chance to win my new set coming out in August!! Hope you play! Thanks to everyone who has already entered! Here is some "faux paper piecing" I did with some punches and October Afternoon "Report Card" DP, which inspired the design and colors of this card. I love the pattern, thought the navy, olive and ivory combo was both classic and fresh, and the repeating flower, dot diamond pattern (not a technical term LOL!) would work really well with the elements I had in my "Fun Year Round" set. After stamping the frame in Vivid Inky Blue, I punched circles out of the DP and Pure Luxury Fresh Asparagus and In the Navy in sizes ranging from 3/4" to 1 3/4". Then it was just a matter of placing them around the frame, making the colors weave back and forth around the card. The circles sometime were exact fits or just bigger, which still looks paper pieced! :) I added just the "happy" from the "oh happy day!" greeting in the bottom and stamped a few large and small flowers in the Inky Blue and olive. An olive button as a final touch gave it dimension and texture. Go through you papers today and find a pattern that speaks to you! PS A challenge throw down for a chance to win my new set coming out next month from Gina K Designs! Read all the details here on StampTV, you have until Saturday night to enter! Please play! This week Sharri gets shrinking, with Polyshrink that is! Inspired by the possibilities with Fun Year Round and shrink plastic, Sharri has three simple projects today! Sharri describers in her own words below how to make all three! For the card, I stamped the circles on the frame and was contemplating what to do with the centers when I remembered I had picked up some shrink paper at a stamp and scrapbook show last year. 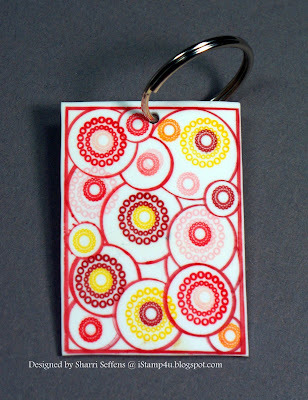 This shrink paper can be used in a inkjet printer so took a chance and stamped the circles on the shrink paper with Memento's inks, punch out the circles, shrank them in the oven and attached them to the card with score tape. I love how vibrant the colors turned out! The sentiment is from Gina's Punchy Words and was cut out with a Pinking Circle Nestibility. The bookmark was very easy to make. 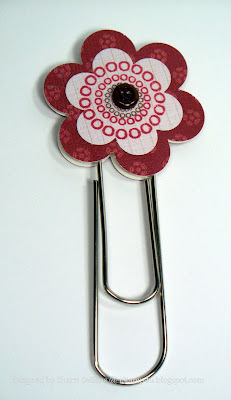 I punched a flowers using two different sizes of the Marvy Flower punches, stamped the circles in the center of the smaller ones, attached a button and attached the flowers to the extra jumbo paperclip using score tape and foam pop dots. Let's go see what else Sharri made! Here is a recent card I made for a Quick Cards call, it didn't get accepted but how I can be upset when it only took anbout 5 minutes to make? ;) I love this design though and will use it again when I am in a pinch for a card! Simply add a rhinestone flourish* to a Pure Luxury White card base, and add a cut and colored butterfly, traced with glitter pen, from "A Beautiful Life" with a pop dot. Use markers to ink up the greeting, giving it a two toned effect. *I get these at Hobby Loby when they are on sale, they are a little more pricey of an embellishment but add so much "WOW", and look at all the money it saved me here on cardstock layers and DP! LOL! Here is a super simple "Aloha" card I made with the appropriately named "Citrus" DP! Love the glitter on this and great matches for Pure Luxury colors in this DCWV pack. I colored the toucan with Copics and then cropped it with a circle die, then layered onto the DP and Red Hot base. Those showy flourishes on the paper complement the bird and prevent the need for a complicated sketch! Anyone gone or going on some exotic vacation this summer? We head for Disneyworld in less than two weeks, so excited! Hope you had a great weekend and a wonderful week ahead! 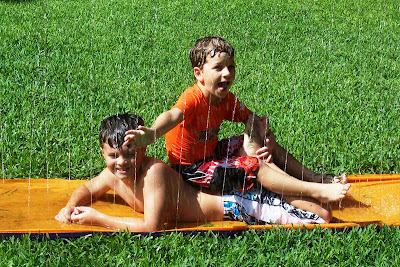 "It's Dare to Get Dirty Week at Splitcoaststampers! If you're a Fan Club Member this is your chance to play along with Dirty Girls, past and present, in a ton of fun challenges. ) If you're not a Fan Club Member, this is the perfect time to become one! You can get all the info here.) We'd love to have you play with us this week! There are 33 challenges to choose from - play one or play them all. if you do play them all (and you can combine challenges on your cards so it's not as many as it sounds like! ), you can enter for the Challenge Queen Prize pack, which consists of 12, count em 12 prizes that have been donated, I don't know what all of them are yet but one is my "A Beautiful Life" stamp set! All prizes go to the winner, go for it! The card I'm sharing today is for a challenge hosted by ME and you can see the details here. (It almost meets the requirements for 6 ther challenges, so you can combine them! :) You WON'T be able to combine 33 into one project thugh, several are sketches!) This shadowbox uses "A Beautiful Life" and Gina's butterfly from "Hope is Faith". Cardstock is Pure Luxury White on the front, Grass Green on the back and lined with Lemon Drop. Front and back layers are 5 1/2" x 8 1/2", score at 3/4" and 1 1/2" on both ends of the green and white, fold on the scores, and adhere the end flaps together with Scor-Tape. When pressed flat, it fits into a large envelope. Butterfly and bee are colored with Copics and covered with Crystal Stickles. I also embellished it with adhesive pearls and some flourish punches. Cardstock is Red Hot, White, and Silver Lining, ink is Versamark and Vivid Brick Red. I filled the inside off the shaker window with microbeads to go with the snowflake theme and embellished the centers of the snowflakes with rhinestones, some colored with a red Copic. The stamped snowflake inside the shaker has a rhinestone on the outside of the clear plastic window instead of on the inside, kind of fun floating like that! 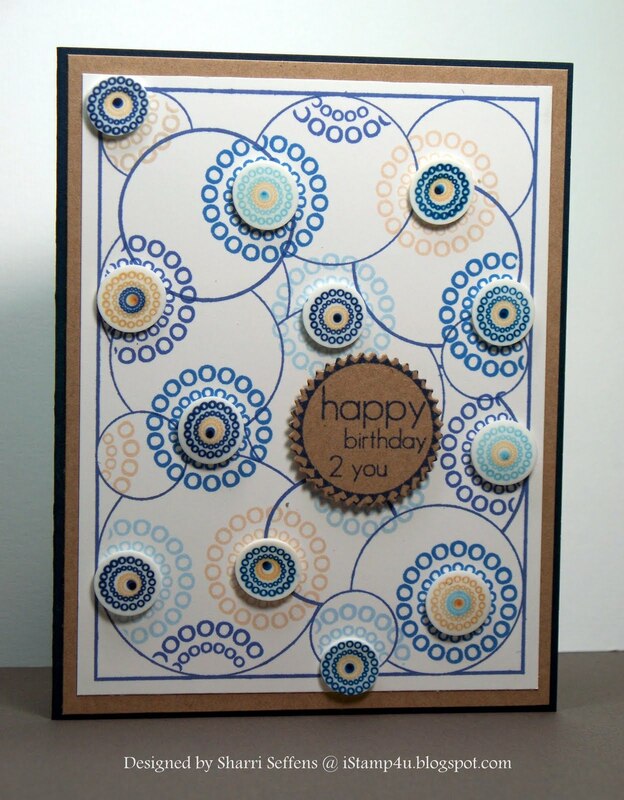 In the following videos, Gina shows you step by step the techniques for creating this card! Thank you for joining us, I'm off to hop myself! Hello! I've been meaning to ink up this hummingbird from "Hugs and Prayers" , and all I see when I look at it is stained glass so I wanted to create a little round window so to speak by tracing a Circle Nestability I placed over the stamped image on white and tracing with a black pen to frame it up. TIP: Find a size die that just fits your image allowing it to touch on three or more sides or places like it is connected to the panes. Using the Nestability allows you to see inside the die for positioning the image the way you want. I colored it with Copics, but didn't go for a smooth Copic look this time, instead mottling the colors by using two or more shades in dabs and removing color with the blender to give it a spotty swirly look like colored glass. Then I covered the whole die cut with Versamark and embossed with white Iridescent Ice EP. Love the sparkly and texture that created, looks like the real thing, wish you could see it in real life as a completely glitter colored image is so hard to photographed but still show all the colors! I stamped some of the flowers from the set on the Innocent Pink mat and sponged the sides with coral ink after coloring the flowers. Other card stock is Pure Luxury Ocean Mist and Black Onyx. Flourish punches in Grass Green and a sateen Copic colored flower and a rhinestone finish the card. To be completely honest, I made this before Brenda posted her Inspire Stained Glass Challenge, but it fits so perfectly I will be tagging it in the gallery LOL! When I first opened Sharri's sample for the week, I was so taken at first with how CaYUTE the little "Fun Year Round" elements look in these pinking circle Nestabilities die cuts (Sharri, I think you just sold me a set of dies!) I didn't even realize I was staring at a gorgeous tiered cake made from these DP layers! Just two rectangles in the sketch plus a few embellishments and you are ready to celebrate! This is a design I want to CASE again and again in different patterns and colors! Simple and simply brilliant! The greeting is from "Candles on Your Cake", she says this is for a baby birthday; I get that from the sweet pastels (love this two tone look with these images in these colors) but I think these fun and elegant prints would make it perfect for a lady of any age! (Look closely and the blue pattern on the bottom layer with the green and blue concentric spots and dots I bet was the inspiration for these little stamped die cuts she created!) The tilted banner gives it a lot of energy and the sponging around the die cuts give each a soft glow. This is a 5 1/2" x 5 1/2" card. I used the pattern papers from Basic Grey's Lilykate to make the shape of a tiered cake and decorated with the fun circle and flower shapes. Now let's go see Sharri's next project! Ever since I first saw Theresa's "Aloha" set, I have been wanting to use it with "Gifts from the Sea"! Finally did, and I love the results! Hello! Just playing with some of my new goodies I bought from the last Gina K Designs release: buttons, ribbon, Spellbinders Scalloped border petite die and the Seeing Spots folder! I used this greeting a little differently this time, just inking up one of the "thank yous" from the round greeting in the set and stamping it so it curves around the punched flower, this tiny sentiment in an unexpected spot makes it extra playful. Cardstock is Pure Luxury Turquoise Sea, Sweet Mango, Grass Green and Lemon Drop. I selected these colors because of a recent color challenge on StampTV, but then just had to throw the yellow in at the last minute! Have a terrific weekend, I have to crank out some serious projects for this next week, some hops and a special somethin somethin for Splitcoast, stay tuned! Anyway, this past weekend we had a laser tag birthday party for my son Jonathan, fun was had by all! (I, ahem, won. *) Although I can't decorate cakes like Janice does, I do like to order a huge yummy sheet cake from Costco** each year but skip having them decorate it, I just put my own spin on it to suit our themed party (see this post for the Diego cake a couple years ago, that was a fun one!) 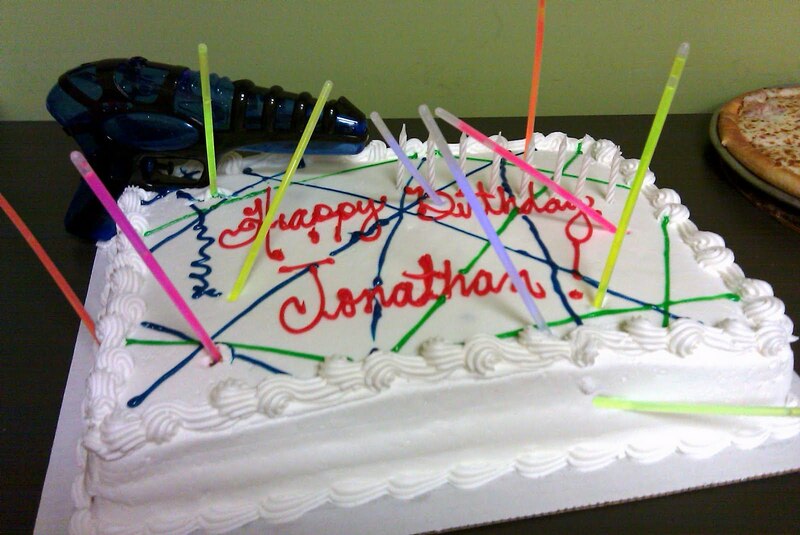 Jonathan and I had blast (hee!) piping on some glitter gel laser beams together in blue and green onto the cake then adding a large water gun from the dollar store and a bunch of glow sticks coming out of the cake, the 8 year olds boys just went nuts for this! (If it had been up to me we would have done just a few less frosted beams and glow sticks, but the birthday boy wants what the birthday boy wants! ) Wish I could have gotten a better pic, especially after we lit the candles (the lights wouldn't go off completely in the party room! 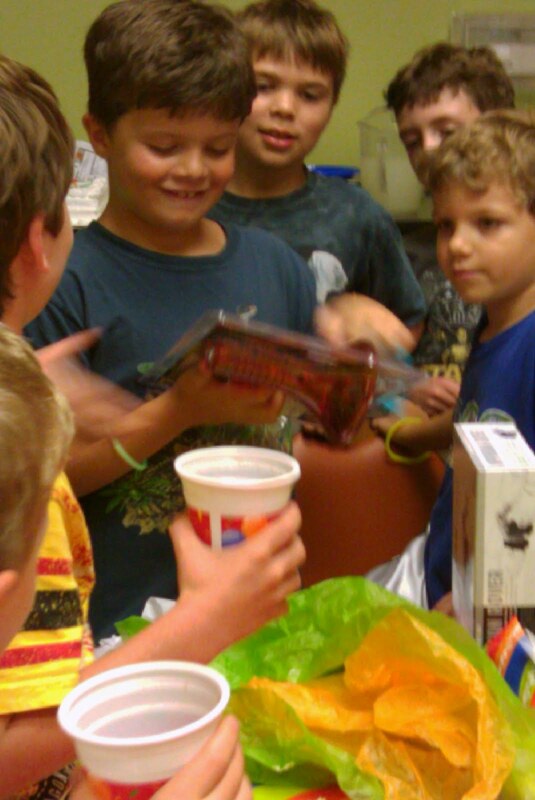 ), I lined them up in front of the gun like the gun lit it, he loved that! We needed to make a bunch of nice thank you cards for everyone after it was over so I took inspiration from our game and the cake that day to come up with fun and easy design, great for boys, using Fun Year Round, can I just say again how great it is to have that extra line in the set?! ;) I stamped the line in red and turquoise on three sides, not bothering to mask, like they were bouncing off the walls of the maze and added some of the large and small elements from the set to look like little explosions ! I made 10 of these cards in a flash, just punching out the greeting with a 1 1/4" and 1 3/8" circle punch. Card stock is Tempting Turquoise, Black Onyx and Red Hot. There are so many other cool, spacey color combos you could use or take the colors from your party supplies to coordinate. I love this card Sharri made today sooooooooooooooooo muuuuuuuuuuuuuch! 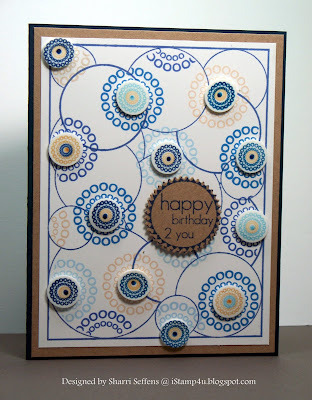 I'd been thinking using just a cut corner from the "Fun Year Round" frame would be super cute on a card, but Sharri's 5 1/2" square card using both top and bottom corners along with this super cool sketch with the large offset circles and repeating circles prints and embellishments is just over the top awesome, don'tcha think?!! Just adore the colors and energy, just seems to move like clockwork! I stamped the frame on a piece of Basic Grey's Eva paper in burgundy and cut off the ends of the frame making sure I cut along the rounded circles. They look like bigger corner pieces which I love. Can't you see them used on scrapbook pages, mini books etc? ("Yes, I can, Sharri!! and more, thanks for the great fresh inspiration!") :) I made different sizes of flower buttons and popped them up inside the circles. To make the buttons, I stamped the flowers then stamped the buttons with Versamark over the flowers and heat embossed with clear and Iridescent Ice embossing powders. This made them really shiny or sparkly. I punched them out with circle punches and then added thread to the middles. For the larger flower buttons, I used the matching button image from "Square Pegs". The other pattern papers are also from the BG Eva pack and the cardstock is Gina's Wine With Everything and Fresh Asparagus. Now let's go see what else Sharri made! What a fun card! I love non-traditionally colored Christmas card and this totally fits the bill! Congrats!! Please send me your snail addy and I will put the set in the mail to you!! Post coming up with some pics for my son's laser tag party this past weekend and a thank you note I designed with my new set to match, I would never have though laser tag while designing that set LOL!! The cake turned out pretty sweet, too (so say the guests)! Then, another guest spot from Sharri! You are gonna flip for her design this week!! Oh, PS! I just heard back on some of things I submitted for publication recently: one got picked up yay!) but the others did not, which means...I get to go ahead and share them here with you (yay!) coming soon! Happy Monday, hope you had a great weekend! Today's card uses a fun color combo I don't think I have done before: navy*, lavender, violet and white. I love this non-traditional Christmas mix! I stamped the "Fun Year Round" frame in Vivid Inky Blue on Pure Luxury White and then filled in a few areas outside the circles with different shades of purple Copics. Next I stamped the bubble burst and snowflake elements in blue, purple and lavender. TIP: to make the elements inside look more layered, mask the surrounding circles before stamping, see how the little heart in a circle is behind the larger one? It may be a little difficult to see in the pic, but I filled in some of the little spots inthe flakes with a Stardust pen, gives wonderful silver shine! I added some adhesive metal dots and rhinestones to the centers of the flakes for some sparkle and popped up the circle punched greeting centered over the large circle in the lower corner. The circles in the frame insure perfect placement opportunities for all your greetings and embellishments! Frame is layered on Pure Luxury In the Navy and Lovely Lavender. I really enjoy making more graphic, modern Christmas cards like these! How about some blog candy? I have one copy of my new "Fun Year Round" set to give away. Leave me a comment below, I will randomly choose and post a winner tomorrow. Followers and subscribers can leave TWO comments! Not following yet? Go ahead and add me to your Blogspot or Google reader today and get two chances to win! Here is a pretty clean and simple card made using Nina's new "Hugs and Prayers" flower, colored with Copics (Coral, Strong Red and Cardinal for the flower, my favorite red combo! ), I used Gina's trick of having my image overlap the long rectangle Nestabilities, click here for the video on how to do that. Today's TIP: When getting a new set of Nestabilitlites dies, and you have the choice of Large or Small, start with Large! Although you will probably want to go back for the other size later for creating 1/8" mats for your other set (which I always do) I find I use the largest dies in the set more often than the smallest dies in each set, and the very smallest ones , sometimes not at all unless I'm making a tiny tag. It's nice to have larger scale dies for framing up larger images, IMHO! After sponging some yellow ink for a warm glow into the top and bottom corner using my die as a stencil, I then matted it onto Black Onyx and added some pop dots to the back. The greeting is from Asela's new "Pretty as a Peacock", and the "You're Special" wraps around the corner of a peacock square. I thought that would be a fun way to add the greeting around this flower but you don't even need to omit the image part: just stamp on your card, then place your matted focal point (needs to have a right angle corner like a square or rectangle) to fully cover the peacock up. That's it, just add ribbon! This dandelion 5/8" gingham is one of my favorite new Pure Luxury ribbon wraps form Gina K, I hope you put at least one in your cart! It's just so cheerful and look so sharp with black white and a pop of red! Hello, and welcome to our first week with Sharri Seffens designing with "Fun Year Round"! :) Sharri created this beautiful 5.5" square card layering the new frame stamped in red on white and layered with the different stamps and buttons in these fun colors to match the different Basic Grey Cupcake DP! The patterned number paper for a birthday and large and small polka dot and circle prints were perfect with the stamps! She also used my "Square Pegs" and "Candles on Your Cake", taking a greeting, candle and cupcake from each, the style of these three sets coordinates perfectly and the round elements will make any birthday card that much more fun! Describe your style/what you think you do best: I really do not think I have a set style. When I sit down to make a card, my mood usually determines the style I go with and changes for each card I make. FAVORITE TECHNIQUE: Oh my gosh! Where do I begin! There are a lot I love like cracked glass, polished stone, paper piecing and sponging or brayering to create a scene. COLORS/COLOR COMBO: One of my favorite color combos is pink and brown. Another combo I love right now is aqua and soft sand or aqua and kraft. FAVORITE EMBELLISHMENTS: My favorite embellies are ribbons, buttons, prima flowers and pearls. FAVORITE GINA K SET BY MELANIE: Seriously all of Melanie’s sets are a favorite. There is no way I could pick just one as a favorite! I love how all of her set can be mixed and interchanged with each other! I just adore Hand in Hand, Just so Hippy, Just so Hoppy, Sporty Accessories and I love all of her frames and flowers sets…see they really are all a favorite! FAVORITE GINA K SETS (FROM ANY ILLUSTRATOR) Oh my, another hard question! I love Asela’s Friendship’s Garden and Flowers for Daisy; Nina’s Lovely Labels and Vintage Borders; anything of Theresa’s; Gina’s Botanicals, Take Flight, Quite a Catch, The Kindred greetings, Tropical Flowers, Thanks A Million; Rupa’s Spring has Sprung, Easter Blessings: Tami’s Stars; Carolyn’s Framed Flowers…see! It’s hard to choose just one as a favorite!!! CRAFT SUPPLIES I CAN’T LIVE WITHOUT: Definitely my Nestibilities, Embossing Folders and of course my copics! I’VE BEEN STAMPING FOR (HOW LONG): I started stamping about 8 years ago after my youngest daughter was born. I was invited to a Stamping Up! party and once I saw how easy and fun I was hooked. I GET MY INSPIRATION FROM: I find so much inspiration magazines, nature and pictures but the majority of my inspiration comes from surfing the internet, visiting blogs, SCS, and Stamp TV. Tell us about your FIRST stamping experience!! 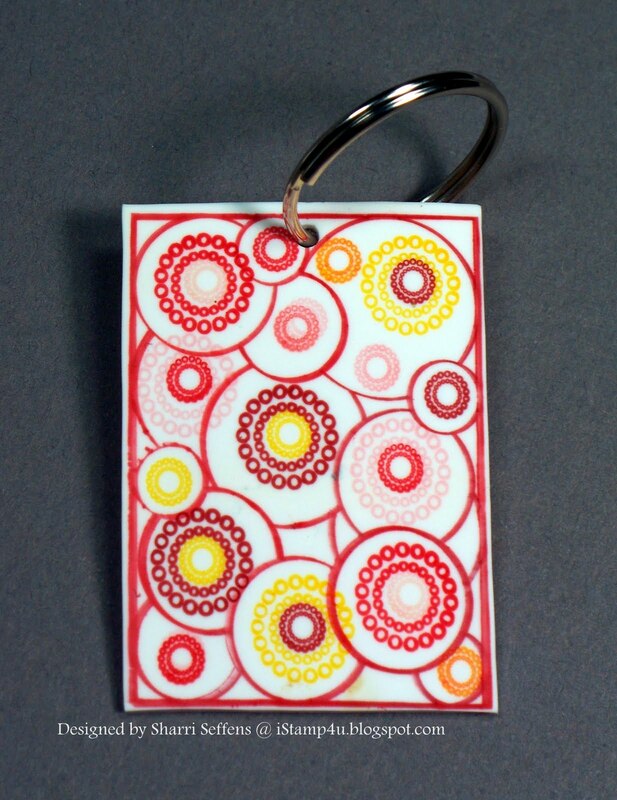 My first stamping experience was a Stampin' Up party that a friend invited me to. 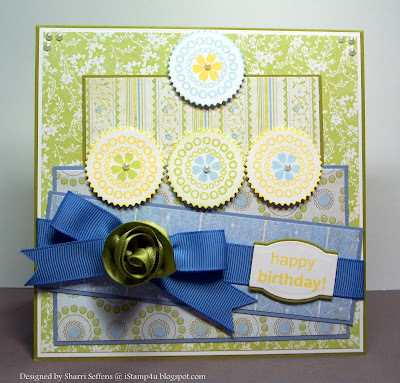 I had never stamped before but when I saw how easy and fun it was to make a card I was hooked. I ended up buying a Christmas Stamp set and made my own Christmas cards that year. Tell us about your most memorable stamping experience!! My most memorable stamping experience is actually a gift I made for a very good friend of mine. It was for her baby shower and I made her a star book using Melanie's Just so Hippy, Just so Hoppy and Hip Hop Accessories stamp sets for the pages in the star book. Kelly actually cried when she started looking through it. THE MOST IMPORTANT THINGS I’VE LEARNED ABOUT STAMPING/CARDMAKING ARE: The stamping community is huge, supportive and full of such talented people who are so willing to share and teach what they know. I have found so much inspiration and learned so much from this community. SOME OF MY STAMPING/CRAFTING GOALS ARE: I am very lucky to have been able to cross a couple of goals off my list this past year. Two goals that I have on my list and am sure many other have, are to be published and to be a permanent member of a Design Team. ADVICE FOR BEGINNERS: Have fun and enjoy yourself. But most importantly, believe in yourself, what you can do and accomplish. FAVORITE THING TO MAKE THAT AREN’T CARDS: I love making treat holders, scrapbook pages, and mini albums. I also like doing other crafts like crocheting and floral arrangements. SOME OF MY STAMPING/CRAFTING ACCOMPLISHMENTS: Being chosen to be in the spotlight by Gina K; being a part of one of Stamp TV’s Center Stage Spotlight Design teams and continuing on as an Alumni; a Challenge Hostess on Stamp TV; a guest designer for Theresa Momber and now guest designer for Melanie, which an honor for me! CHALLENGES I LIKE TO PARTICIPATE IN: I like to participate in the Stamp TV challenges. When I can I try to do the Card Positioning Challenges and other challenges on some of the blogs that inspire me. I would do a lot more challenges if I could squeeze a few more hours into the day. Lol! TELL US SOMETHING ABOUT THAT MIGHT SUPRRPISE US! I am a quiet/shy person which may or may not be a surprise to some people. But this story surprises a lot of people when I tell them because I am so quiet. WHAT I DO WHEN I’M NOT STAMPING: I work full time and am a Business Analyst for a major insurance company. When I am not working or stamping, I enjoy reading, walking, biking, movies and most of all, I love to spend time with my daughters and husband. A FAVORITE QUOTE: "Faith is taking the first step even when you don't see the whole staircase." -- Martin Luther King Jr. I just love reading these responses from my guests each month! Now let's go visit Sharri, ready, set GO! Now you wouldn't know it, but before I had time to crop this image for my card, I managed to drop an inked stamp on the left side and got half of a different image on and around the coloring I'd labored over! Wahhh! There was no die that could possibly crop it all out, although this one came close. It looked like the only way to save it would be too cut it all out, which, I did NOT want to do. Instead, I chose this Labels Eight Die that was just slightly bigger than the image, sponged ink around it to hide the lighter bits of the boo boo, and then adhered this button over the edge and hiding worst part...and I actually like the way that button looks there, even going over the image for no good reason at all! Yay! Crisis averted! A truly "Make it work!" moment! I added a stitched border from Tami's "In Stitches" to the DP, stamped in Vivid Coffee Bean. Card stock is Little Boy Blue and Chocolate Brown , I also used what I call the storybook die (Labels Seven) to mat under my image and a bit of stitched ribbon, pleating it to create a little tab for my button. Buttons are too beautiful and fun to hoard, they must be played with! Fun Year Round is the prefect backdrop for adding an assortment of buttons in contrasting colors and various sizes, and even adding one of its round greetings to a button with Stazon! Until my new buttons arrive (I'm crossing my fingers for Tuesday, we'll see! ), I am working on using up my Basic Grey Cupcake mix here! After I adhered all the buttons with glue dots, I chose coordinating Copics to fill in the tiny spaces in between the circles, making the color bounce around, for instance putting red in corners opposite a red button, etc. This is a single layer card stamped on Pure Luxury White in Memento Black ink. This card just shouts happy! I hope you were able to catch part of the Gina K release party last night! My son Jonathan turned 8 yesterday so we were out having our own celebration for most of it, but here is one of the cards Theresa posted for me while we were out, thanks Theresa! It has the "Fun Year Round" frame stamped in Black on Pure Luxury White, with Theresa's flowers from "Aloha", directly over it. No masking! Stamping the large one at the bottom and the smaller ones at the top opposite corner balance the design, and all the different circles create wonderful spotlighting opportunities, I colored each bit of the flower in slightly different shades as I moved from bubble to bubble. The many lenses kind of gives you a compound bug's eye view, which I love! TIP: When coloring "white flowers" use a very pale green near the center to emphasize the pure whiteness of the petal, I use Mignotte Copic, or a very pale aqua to outline the edges, this keeps them from looking like you just "forgot" to color your flower petals! Alternating the different colors to the circles surrounding them is like a playful bunch of beach balls, I just think it goes wonderfully with the festive, tropical theme of her set! Finally I layered it onto Passionate Pink and Lemon Drop and then added some white paper flowers with yellow brads for more texture and dimension. I hope I make it to Hawaii myself one day! :) Have a terrific 4th of July weekend with your families as we celebrate our Independence! Safe travels! PS My tip sheet for this new set will be posted shortly; as usual, it is pretty long!